NUST finished out our fall 2018 quarter at MCSA Fall Champs at the local Columbia Yacht Club! We finished 5th out of 14 teams. Two berth’s worth of sailors went to Madison for Wisco Womens! One day of sailing was cancelled due to a sudden snow storm and high winds, but we made the most of our sailing on Sunday and finished 5th and 6th. NUST sent five awesome women to Cornell for a weekend of bad weather and excitement in Upstate New York! We had an exciting weekend at the Coast Guard Academy in New London, Connecticut! NUST placed 3rd at this lovely weekend at the University of Michigan! NUST had lots of fun at our local Chicago Corinthian Yacht Club sailing in offshore keelboats! We placed 15th overall in the Western Semifinals of Co-ed Nationals, finishing with 13th in A's and 14th in B's. 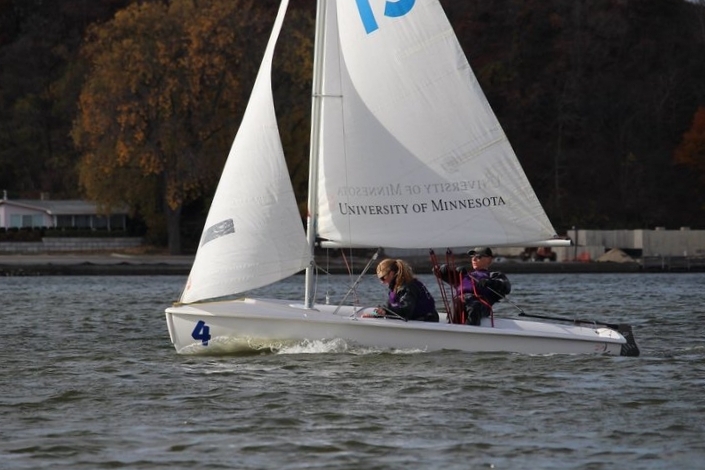 We hosted the final MCSA regatta of the season, the NU Spring regatta! NUST had a lot of fun sailing at home in the warm weather. Thanks to everyone for coming out! We placed 3rd in A's, 3rd in B's, and 3rd overall at Co-ed Qualifiers! We finished 4th at Women's Qualifiers during a very chilly weekend in Michigan and learned a lot of sailing! This weekend, NUST competed at the Thompson Trophy, hosted by Connecticut College at the Coast Guard Academy. The regatta was sailed in three divisions, rotating through FJs and Z420s. The conditions were partly cloudy, with extremely shifty Southwest winds from 5-15kts. Jacob Bruce and Kate O'Donnell flattening their boat. They learned from the high level competiotion that we don't need to be complacent with our flattening-- it can always be faster and better! With the exception of NUST and two others, all of the 18 teams present are top 20 ranked nationally. Most teams sent their top sailors, so it's not an exaggeration to say that we were competing with the best sailors in the country. This is the highest level of competition NUST has seen in years, and it was extremely instructive. We learned that our boatspeed is sufficient to hang with the top sailors in the country: we had a number of top 5 roundings and several top 10 finishes. More importantly, we learned what we need to work on to hit those marks more consistently. East coast starts have a completely different form than MCSA starts, with the fleet setting up much earlier and accelerating in very small holes simultaneously. When we started well, we were competitive with the fleet, but this was a hit-or-miss proposition. Additionally, we noticed a couple of small boat handling differences that can up the game of our maneuvers, especially in Midwest fleets. Additionally, Jacob Bruce and Kate O'Donnell had one very noteworthy second place finish. Overall, the weekend was the most intense racing NUST has seen all year. We had a lot of fun, and we're coming out of it feeling tuned up and ready to sail really fast at our Coed and Team Racing Championships coming up in the next two weekends. NUST sailors took 1st in the MCSA Fall Championships! Congratulations to Kate O'Donnell, Noah Rosenthal, Audrey Debruine, Mark Davies, Ryder Easterlin, and Micheal Pauleen! Saturday was a great day of late fall sailing with temperatures in the 50's, winds from the south-west at 7-10knts, water temperatures in the high 50s. Winds were shifty, and slowly clocked to the west throughout the day. Mark and Audrey started off the regatta in A division, while Noah and Kate started in B's. Macatawa Bay YC hosted a banquet on Saturday evening. Sundays racing consisted of windier conditions, a westerly persisted throughout the day, steady between 13 and 20 knots of wind. The windier sailing provided for fast conditions, and we felt right at home. Temperatures were in the mid to upper 50s, and the sun never wavered. Michael went in with Marc in A's, and Ryder joined Noah in B's. After a hard fought weekend, Northwestern ended up with the low point in both divisions, earning us the overall regatta win! Here's what Noah had to say about Fall Championships: "This was a fantastic regatta for our team. Kate and Ryder were amazing at managing the fleet throughout the weekend, and it was a pleasure to sail with them. Communication was also great between divisions. We made it a point to talk to the other boat before they went out, and then debriefed with Coach Cornew and the other sailors on shore. Thanks to Hope for hosting an amazing regatta, and go NUST! The future is looking bright!" NUST sailors Jennie Werner, Gui Vendemiatti, Zac Li, and Josh Kaplan had a fun weekend competing at Hope College scoring 6th overall in the fleet. Although the conditions were less than ideal, ranging from some gusty wind to windless and drizzling rain on Saturday, the sailors all took something away from the experience besides just a good time. "I learned a lot about how to manipulate sail controls (vang, downhaul, outhaul) to improve the shape of the sail," said sophomore Gui (who was competing in his first regatta!). "I learned how right of way plays into tactics and how to better read a course," Josh said. " I also locked down my technique for downwinds, and learned that Zac Li is a great skipper, teacher, and pal." Unfortunately, the second day of racing had to be called off following a postponement due to not enough wind and a dismal wind forecast. Northwestern sailors Noah Rosenthal, Kate O’Donnell, Sam Harney, Audrey DeBruine, and Mark Davies brought home a huge 1st place win while represent NUST in the Timme Angsten regatta at Chicago Yacht Club. On Saturday, the wind was medium-light with huge chop. Due to the proximity of the race course to the break wall, there were large amounts of cross chop, too. Other teams found it very challenging to sail through the waves. However, Northwestern had a home team advantage with three of its sailors being from the Chicago area, two of whom grew up sailing out of the Chicago Yacht Club, so they were well trained on how to properly handle the unusually unruly waves. “While watching the races from shore on Saturday it seemed like the boats were racing in a bad stop motion movie because they would stop completely from hitting a wave and then shoot forwards surfing another. It was something that I had never seen before and was quite amusing to watch,” said Freshman Mark Davies. The breeze on Sunday was about 14-16 kts and the wave state more consistent. NUST ultimately came out on top overall, but they had to work for it with the top four teams in A division being very evenly matched NUST came out in 3rd. The B Division was slightly less competitive, and Northwestern dominated much more consistently getting a handful of 1st and 1st in the division. Thanks to the the generous support of Alumni and friends, six NUST women and Coach Cornew were afforded the opportunity to travel to beautiful San Diego, California to end the 2016 season by competing in the Sperry Women's Semi-Final Championship sailed in North San Diego Bay! 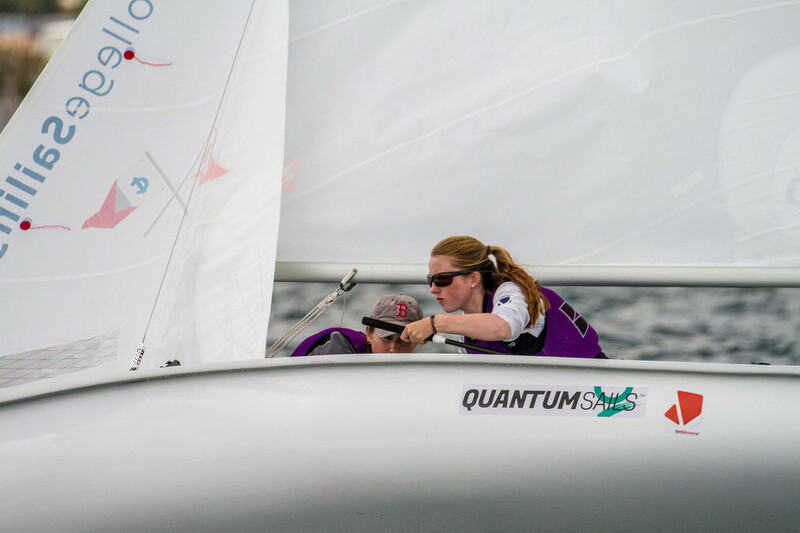 "It was truly an incredible experience to be out there racing against the top female sailors in the country, girls who will be All-Americans, Olympians, and future leaders of the sailing world," Freshman Kate O'Donnell said. Photos from ICSA website. That face says don't mess! There were 36 teams competing, split into Eastern and Western Divisions each of 18 teams, and Northwestern competed in the Western division of the Semi-Final. The regatta was compiled of 12 races sailed in FJ's on a windward-leeward course with four legs. 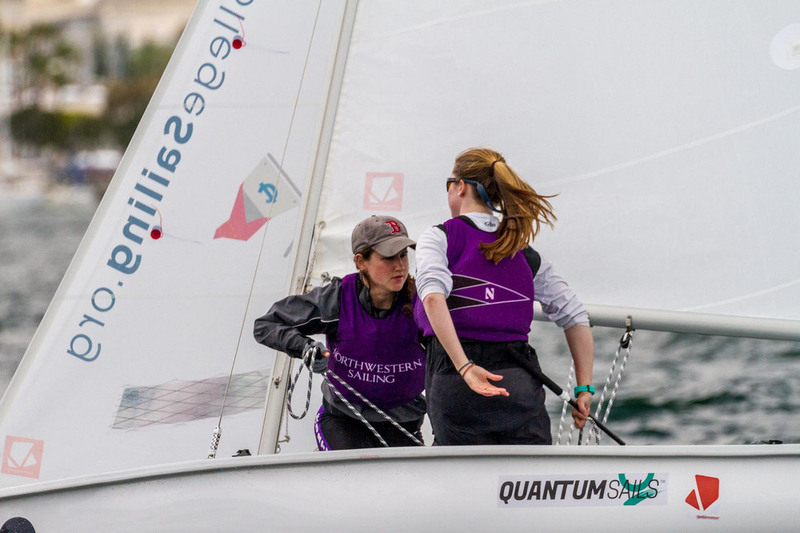 The NUST women ended up finishing in 17th not advancing to the Finals, but consistently kept up with the fleet earning several mid-fleet finishes. During one race, the NUST A boat even rounded the leeward mark in 5th place after the first beat due to a tremendous start, but hey, then other things happened. At most MCSA mistakes are recoverable, but in San Diego the team learned that every mistake, no matter how big or small, will cost you when sailing against such a highly competitive fleet. Perhaps both the greatest challenge and the greatest learning opportunity for the team came from the starts because all 18 boats were all on the line, and all accelerating perfectly at 20, then 10, then 5 seconds from the start. "From land, the starts were a beautifully intimidating sight, and on the water it gave me a taste of some real aggressive competition. For the most part we lagged behind in the starts, but we learned, as the regatta went on, to sail at that level of aggressive competition," Sophomore Hannah Givertz said. "The quality of sailing was impeccable and the quantity of the quality of sailing was unrivaled by anything I have ever seen at the college level." Kate O'Donnell and Hannah Givertz sailed the A boat, Susie Riley and Sophia Krevans sailed the B boat, and Sam Harney and Madison Shirey substituted in a alternates. With all of the sailors besides Senior Sophia Krevans returning for at least two more seasons, the trip to Nationals served as a great motivator by showing them that they have what it takes to hang with that level of competition, and with hard work and practice they can return to Nationals when Northwestern co-hosts them in Chicago next spring. This exciting, challenging, and memorable experience would not have been possible without the exceptionally generous support our loyal NUST alumni! The team was humbled by this support, and because of generous contributions from Alumni and friends the team's airfare, (steep!) regatta dues, and rental cars were completely covered- WOW. On Saturday, NUST came in 3rd place qualifying for Nationals by a nerve-racking 1 point margin! (Please see our fundraising page to help send 6 women to San Diego this May!!) 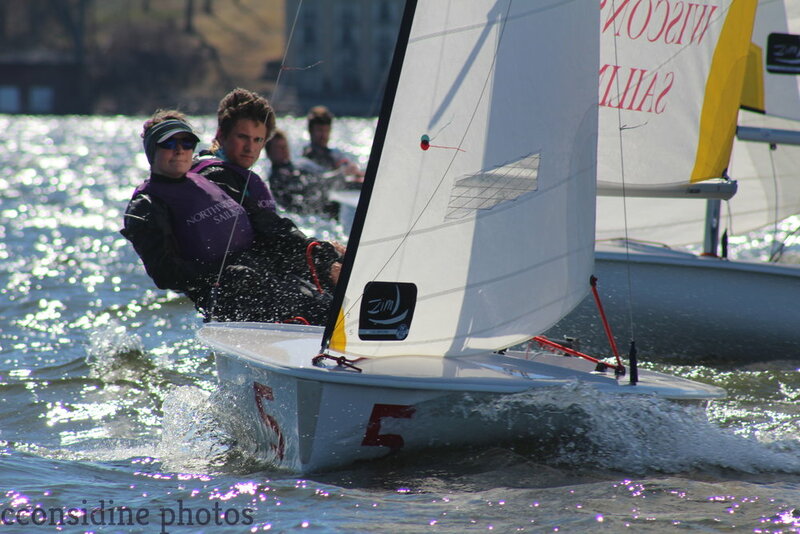 The regatta was hosted by Denison University on the Hoover Reservoir, and Saturday's beautiful weather made for some great FJ racing with wind averaging 8 knots and gusting up to 10 knots. In the first race of the day on the windward-leeward course, Wisconsin was in front and incorrectly rounded the leeward pin on starboard instead of completing a correct port rounding. They would have received a DNF, but every single other boat played the game of follow-the-leader resulting in the precedent being set for a starboard rounding for the remainder of the regatta. This (admittedly kinda hilarious) faux pas pretty significantly altered the sailing of the course making it "funky" for lack of a better word. Senior Sophia Krevans said that it was the most competitive and tight regatta she had seen for Women's Quals in her four years. Wisconsin and Minnesota had a secure hold on 1st and 2nd that didn't waver much throughout the day in both A and B division with Michigan State and Milwaukee staying head to head with us battling for the qualifying spot. In the last B division race Sophia and Susie had to place 3rd and Milwaukee had to place 4th putting Michigan State in 5th in order for us to qualify, but they were completely unaware of this on the water. From shore, it wasn't possible to tell whether Michigan or Milwaukee had crossed first, so Coach Cornew, Sam Harney, Kate O'Donnell, and Hannah Gitvertz were losing it (read: about to soil themselves) waiting for Susie and Sophia to get to shore so they could find out if we qualified or not. Susie and Sophia were shocked! The squad finished 3rd in A Division and 3rd overall. Freshman skipper Kate O'Donnell says it was a huge learning experience for her since we don't typically practice in FJs. She explained that as the day went on she was able to be a more aggressive competitor because she got a better feel for the boats and their ability to point much higher than 420s and reach layline around two boat lengths sooner. The team also worked on covering on the run to the leeward pin, and they improved their ability to stay tight on the line to the pin forcing the competition to make wider jibes. CONGRATULATIONS TO OUR STRONG FEMALE SAILORS!! !